You know that song, “He’s Still Working on Me”? It’s a song of my childhood that I often sang in Sunday School. When I was little I didn’t completely understand how long it would take for Him to be done working on me. Let me tell you, He is still working on me and He has a long, long, long way to go. Every day as I watch my munchkins I see myself in their behavior/character/attitude and I think, wow I really need to work on that so that I can have them work on that. He's still working on me to make me what I ought to be. The sun and the earth and Jupiter and Mars. How loving and patient He must be, ‘cause He's still working on me. Don't judge her yet, there's an unfinished part. Fashioned by the Master's loving hands. Make me wonder why He never gave up on me. Remember He's the Potter, I'm the clay. Something I continually learn over and over is that I have so much to work on. So many days, I see my ugliness but then I remember that the Potter hasn’t finished me yet. I have to stay moldable so that He can finish and someday He’ll be done and I will be all He is making me to be. Until then, I’ll just remember that He loves just as I am right now. He loves me like I love my kiddos, so unconditionally without reservation no matter what. Because He is still working on me and He hasn’t been working on them nearly as long. Isaiah 64:8 (HCSB) Yet LORD, You are our Father; we are the clay, and You are our potter; we all are the work of Your hands. Philippians 1:6 (HCSB) I am sure of this, that He who started a good work in you will carry it on to completion until the day of Christ Jesus. Ephesians 2:10 (HCSB) For we are his workmanship, created in Christ Jesus unto good works, which God hath before ordained that we should walk in them. Welcome to Mommyhood Adventures! My little corner of the web where I post my adventures in mommyhood and life. I am blessed to be the wife to one amazingly wonderful man of God and a mommy to four adorable blessings. 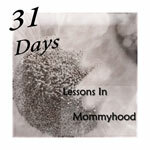 I am enjoying Mommyhood to the fullest. I know that being a wife and a mom is what God has called me to be. God teaches me and stretches me in ways I never knew were possible through this adventure called “Mommyhood” and, I am learning that to rely alone on God's strength is so much better than getting a full night of sleep any day. Never miss an adventure have Mommyhood Adventures sent to your inbox.